The fitness challenge in Dubai has been ended and this change is a good start for the UAE national is simply amazing. A Filipino expat in Dubai 34 yrs. Rommel Manio was one of those people who participated in the Dubai fitness challenge at the Ghurair Centre in Deira, at the result he loses 10kg in less than a month. And without going to the gym. 'lose to win gold challenge' and the campaign started the first season to motivate the visitors of the mall to be healthy. And launched that at the reward of the fitness challenge with the gold as gram as loses each kilo of weight during the period of challenge. To make this challenge possible many visitors accept the challenge to lose weight without going to the gym in the mall and win gold by losing each kilo as the reward. 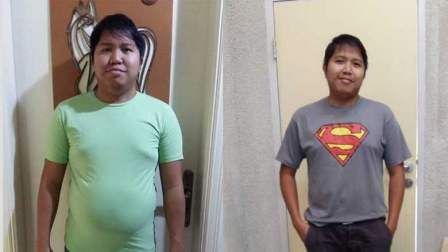 Rommel who always wished to lose his weight, but unable to fix the time for exercise, after heard the challenge about ‘lose to win gold challenge’ it gave him a push forward. He stated, "Before this challenge, I would try and run or jog every night after work 3km to 5km but with this gold challenge I increased my distance to about 10km every day. I also changed my diet and went completely vegan for six days a week. I ate only fruits and vegetables during the week and ate meat only on weekends." On the weekends Rommel also joins free fitness classes by the center of this premises, Rommel said: “My life has changed 360 degrees as I feel so confident and comfortable with my own body before this am suffering back pain now completely gone after losing weight.” After this, he stated at another place, "My whole circle of friends and family are shocked at my transformation and I have inspired people around me to take up fitness seriously. I am grateful to the Al Ghurair Centre and the Dubai government for organizing such innovative competitions that remind and motivate us to take care of our health." After winning the gold he said, "This is my souvenir for life, my trophy that will always remind me of the effort I put in to get back in shape." The Head of Marketing of Al Ghurair Centre, Zainab Badar said, "With over 9,500 people registered, the second season of Dubai Fitness Challenge at Al Ghurair Centre has been a huge success. Consisting of a range of free fitness activities for all, the participants were encouraged to lose weight and win gold. This initiative was to support the vision of Sheikh Hamdan bin Mohammed bin Rashid Al Maktoum, Crown Prince of Dubai to create a truly inclusive fitness movement across the city and the wider UAE, making Dubai the most active city in the world."